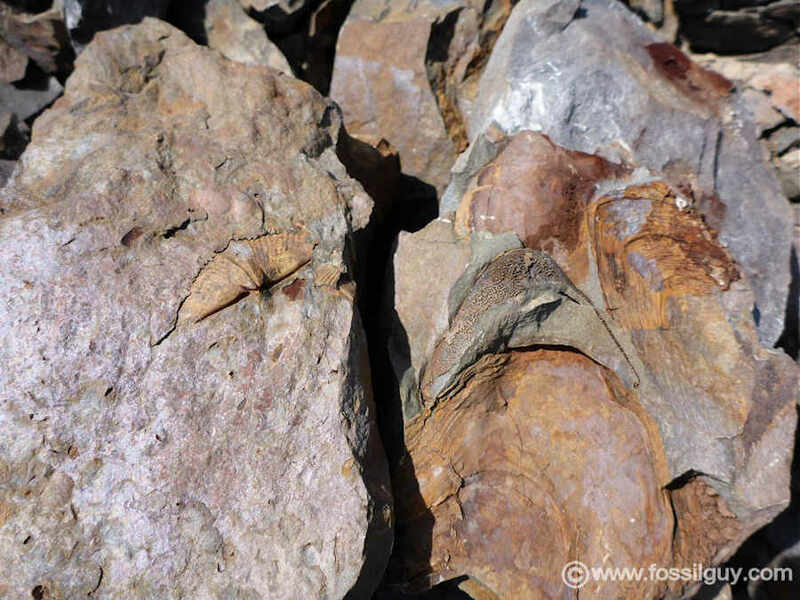 Click on the type of fossil to go to that fossil ID section. 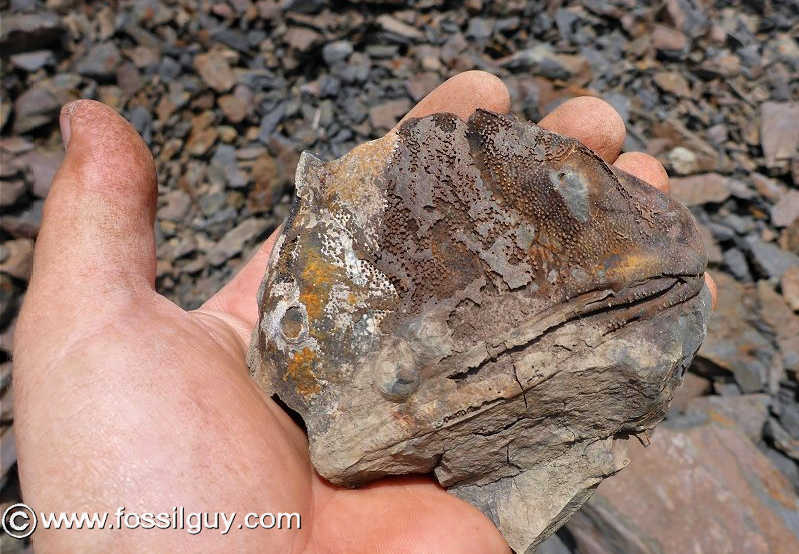 Dipleura Trilobite from the Mahantango Formation - Found and prepped by another fossil hunter. Trilobites are a group of extinct arthropods (similar to crustaceans) with a hard shell. They are common in Devonian rocks in the Mid-Atlantic. In the Mahantango Formation, almost all are found as fragments. Occasionally whole ones are found and are usually enrolled. 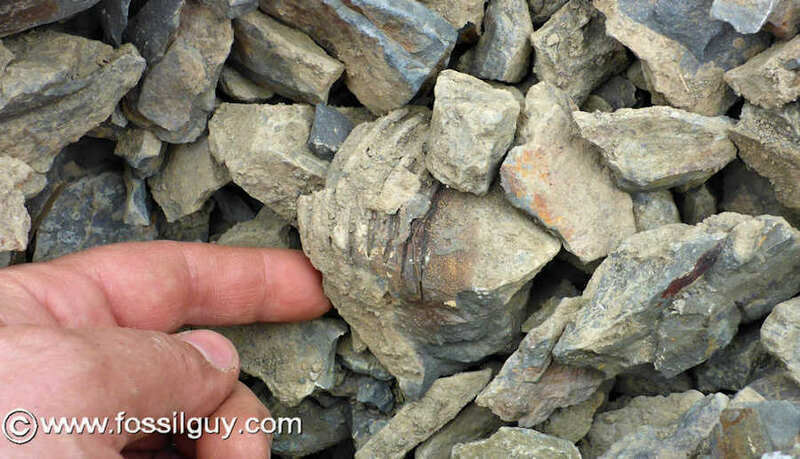 Different layers of the Mahantango contain different types of trilobites. The most commonly found trilobites are Eldredgeops, Greenops, and the large Dipleura trilobites. 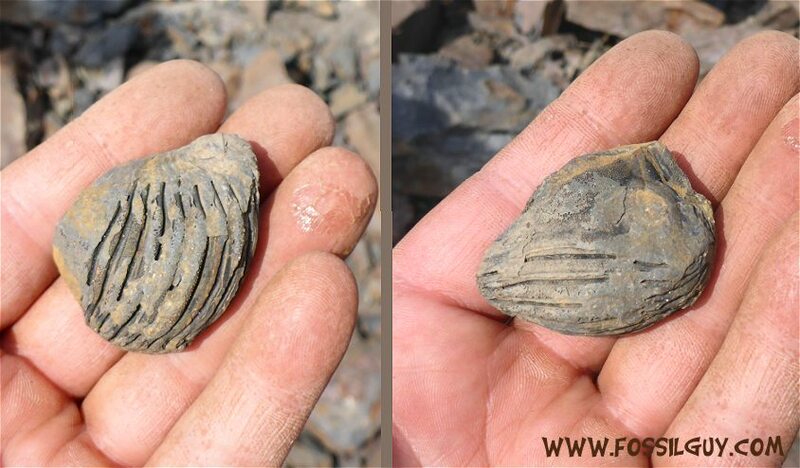 Dipleura trilobites from the Phacopida order are the largest trilobites found in the Mahantango and also the most sought after. They are large carnivorous trilobites that patrolled the sea floor. They have large eyes and an elongated cephalon. A notable characteristic of Dipleura is the structure of their shell, the shell is not smooth but covered by tiny bumps. This bumpy pattern makes identifying Dipleura fragments fairly easy. This is a large enrolled Dipleura triobite from the Mahantango. It's 3 1/8" across (around 7" if not enrolled). It was found on This Fossil Hunting Trip. This is a large enrolled Dipleura triobite as it was found. It looks like it tumbled down the talus slope. This is a smaller enrolled Dipleura triobite from the Mahantango. This is a complete prone Dipleura triobite from the Mahantango. It was found and prepped by another Fossil Hunter. This is how Dipleura are usually found, as partials. This is the Pygidium (tail) and part of the Thorax. Fragments are often found. This is a large Dipleura Cephalon (head). Fragments are often found. This is a large Dipleura Pygidium (tail) with some Thorax segments. 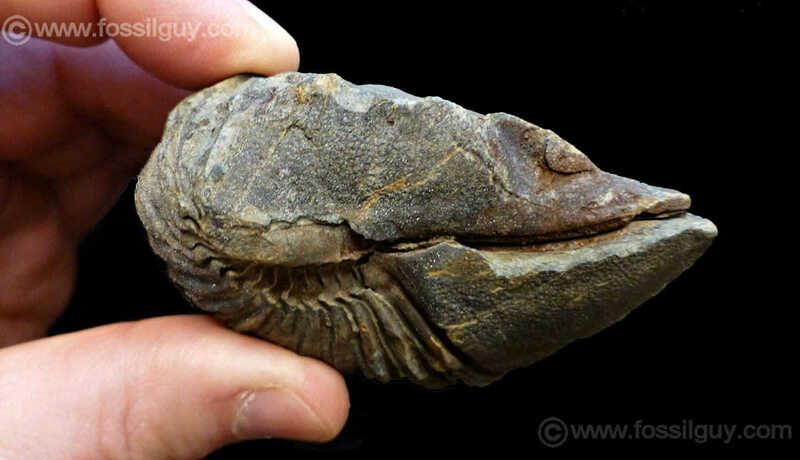 Trilobite fossils are some of the most beautiful and collectible fossils in the world! 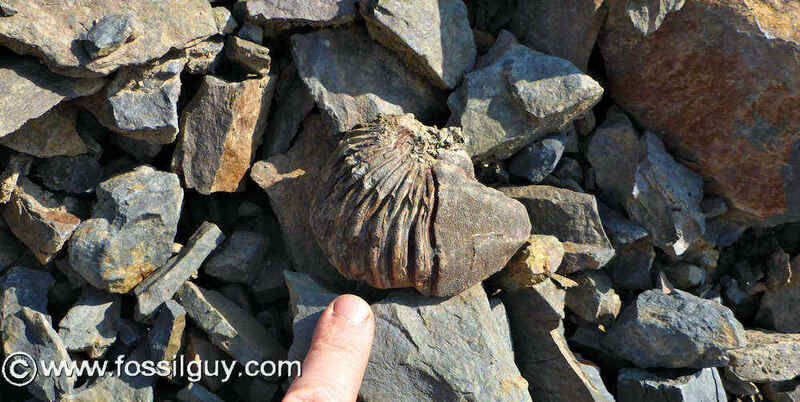 There are countless species and countless colors of trilobites. They make beautiful display pieces and conversation pieces. Common ones make very affordable for gifts to fossil and paleontology enthusiasts. 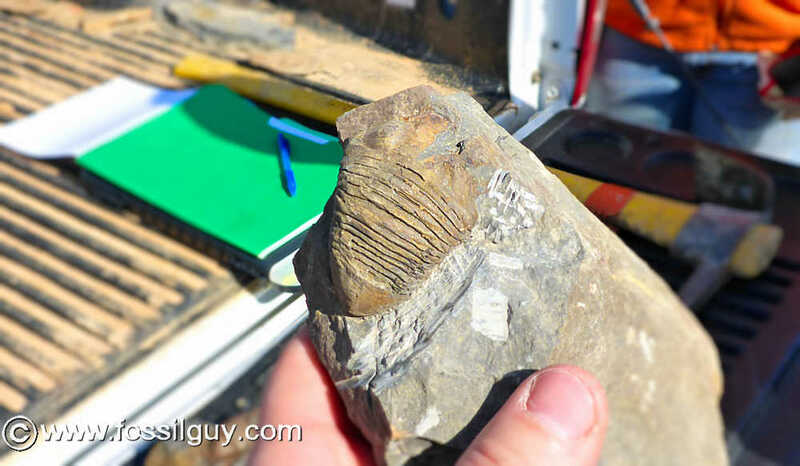 Fossil Era has a huge selection of top quality trilobites from many states and many countries. It's fun just to browse through the inventory and look at all the different types!